This September, we are awesomely happy to present you with a new space conquest game! 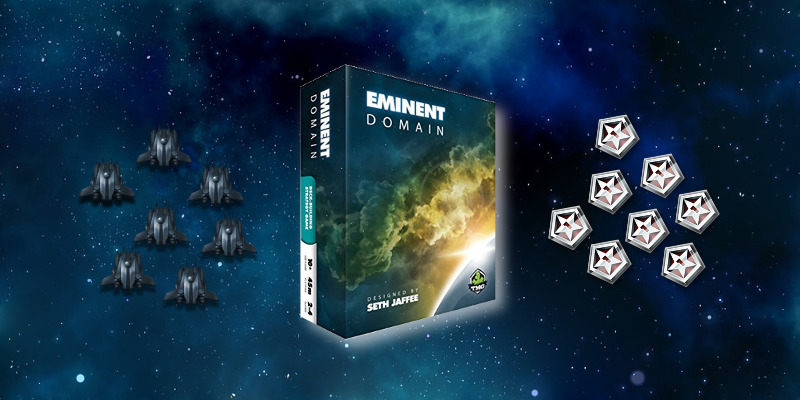 Eminent Domain from designer Seth Jaffee published by TMG (Tasty Minstrel Games) is now available on Board Game Arena. So would you like to expand your Empire throughout the whole galaxy? Peacefully through colonization, or just by sending your fighter jets to take over? In Eminent Domain, you'll get a starting deck with two of each cards in it (Survey, Research, Colonize, Produce/Trade, Warfare), then draw a hand of 5 cards. At the start of your turn, you'll choose a card to use as an Action, then you'll choose from the available Role cards stacks one card from the type you want (that will come to reinforce your deck), and apply its Role effect (that you'll be able to boost with other cards of the same type in your hand, and that other players will get a chance to follow in order to benefit from the effect). This game has a really nice flavor to it, due to the fact that you can manage your deck really from the start with Research cards to trim it down in the direction of the strategy you want to build up, to the numerous Technology cards you can get with enough planets and Research to accelerate your expansion, to the beautifully rendered space universe and to the option to expand into "scenario mode" with thematically preset starting decks. We are pretty sure that all Race for the galaxy players will really enjoy discovering and playing Eminent Domain! For this game, we would like to thank the publisher TMG for their authorization to create this online version, and for their enthousiasm in playtesting to help us rule out bugs and make it as good as possible! And of course, once more we send our warmest thanks to the developer Elena Laskavaia (Victoria_La)! As a fan of Eminent Domain she suggested us to contact TMG in the first place, and then implemented an awesome adaptation to gift the BGA community once more with an excellent game! And now, get those fighters off the ground and into action! Awesome adaptation! With hot game titles being added, I'm seriously considering going premium! Keep them comin', BGA! So happy to see this one arrive. I have been wanting to try it. I don't understand why more publishers don't push for digital versions of their games. When I find a digital version of a game I like I end up buying a hard copy. GMT games does this with Vassalengine.org. I'm sure they would tell you doing so boosts their sells. Anyway thank you to TMG for allowing this game to come to BGA. Yes ,yes i waited long for that, and a super option to implement the Escalation expansion. Another one I've got in my collection, but haven't been able to get to the table. By having it here, I get to use that as an excuse to play it so we can learn another game to play on the site. Love this site. I paid for a year, and once that's up, I can't imagine not renewing if you can keep up the pace you've been on this year. Actually, I'd probably renew regardless, but keep 'em coming anyway. Bundyman wrote: Yes ,yes i waited long for that, and a super option to implement the Escalation expansion. is the full expansion available or just some of it? Thank you. escalation, exotica and oblivion powa!!! It's fun (sort of dominion/race for the galaxy cross) but I think the BGA adaptation might have a glitch. When you do not dissent but play on the opponent's role, it seems like cards played from hand don't get cycled back into the discard pile -- they are removed from the game. I don't see that in the rulebook. Pianowire wrote: It's fun (sort of dominion/race for the galaxy cross) but I think the BGA adaptation might have a glitch. When you do not dissent but play on the opponent's role, it seems like cards played from hand don't get cycled back into the discard pile -- they are removed from the game. I don't see that in the rulebook. I don't think you are correct. I have been playing a lot of games of EmDo on BGA, and I have not had that problem.